Dear readers, thank you for sticking with me through everything. As I write more query letters for agents and fine-tune the synopsis for editors, I cannot help but notice how little is posted about the latter. What is it about the synopsis that scares writers? The best way to get over the fear is to write it first. If you know the plot of your story, then you should have no problem dishing out the details. I think it even works better than an outline in some cases. Remember: The synopsis isn't a sales blurb, neither should it leave the reader in suspense. 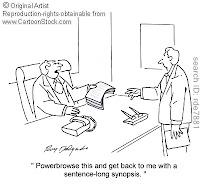 So, when writing a synopsis, tell all. So, we all know a synopsis is a description of the best parts in our books, but did you know there are different kinds? 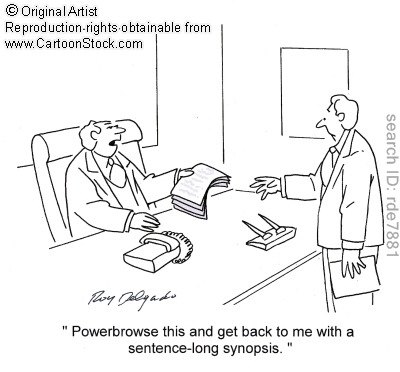 Have you ever wondered what the difference between a brief synopsis and a full synopsis is? A brief synopsis is a detailed description in present tense usually 350-450 words and between 1-2 pages long. Don't confuse this with a "brief summary" which is better known as a pitch. A short synopsis is a detailed description in present tense usually two to ten pages long, and five pages at the most. A full synopsis is a detailed description in present tense of the whole book with each page representing a whole chapter or one synopsis page for every twenty-five manuscript pages. The most popular request I've seen from editors/agents is a brief synopsis of about 1-2 pages. This doesn't mean you shouldn't write a longer one. Sometimes the best way to choose the best lines is seeing a bigger picture of your work, a broader landscape. Read through each page of your manuscript and write a summary of each chapter or so on. Look for themes and symbolism as you read. Take out the most important plot points and characters, anything that moves the story forward, and put them in the synopsis. Capitalize the main character's names the first time they are mentioned in the manuscript. Double space like you would your manuscript. Write to entice the reader. Think: Hardcover book jacket blurb meets enthusiastic movie description. Write in present tense, third person. Remove as many adverbs and adjectives as possible and replace them with action. And please don't leave the reader in suspense. Writing a synopsis can be a scary endeavor, but anything is possible when you put your mind to it. I look forward to seeing you all on St. Paddy's Day for an Irish recipe and a giveaway! 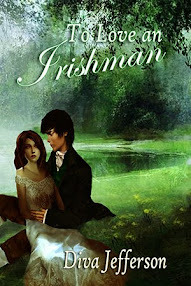 What better way to celebrate the one year anniversary for the release of To Love An Irishman by Diva Jefferson? Take care.